Passionate about life! | Your Top 5 To Living! My Tapas* journey spans over 6 months of gastronomy with my fanatical gourmet friends, my fellow ardent foodies club members and chummy food connoisseurs alike. What was meant to be an earlier entry has been far delayed due to mixed reviews and my tossing about on the rankings but finally, the verdict! 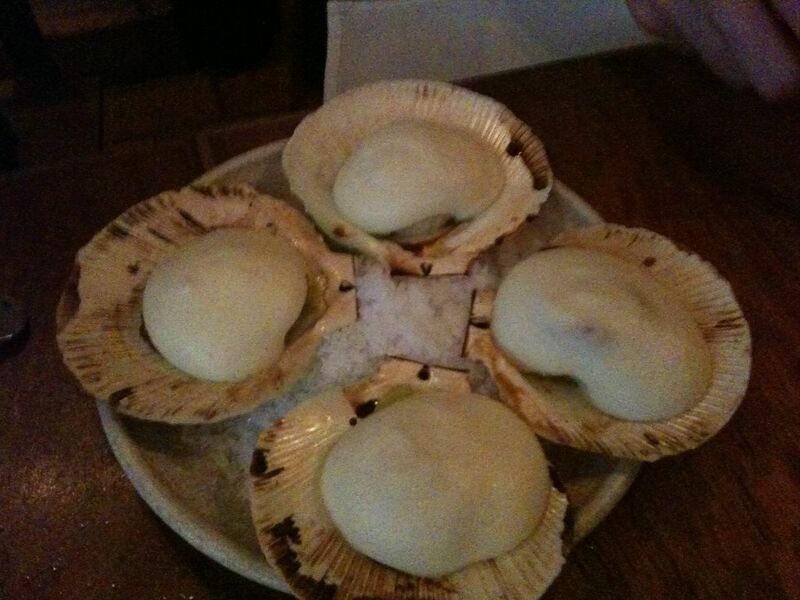 So here you go Melburnians, here are my Top 5 Melbourne Tapas joints. Disfrutar#! Facinating fact. Did you know that La movida was an era of Spanish expression with glitter-covered bodies, exaggerated makeup, leather jackets and crazily styled multicolored hair? It was an era of punks, glams, rockers– known primarily as the “spirit of the Spanish 80s”. Interestingly the only hedonistic thing about the Spanish tapas restaurant Movida is the food. And oh where can I begin? Well, let’s start with the freshly shucked oysters and lemon, an array of newly baked breads (fresh from the oven), and seared scallops with an explosion of flavours topped with a surprising foam texture. Then captivate your tastebuds with a salty anchovy biscotti and tomato sorbet. Next, devour the succulent lamb cutlet with mint, parsley and pork pate stuffing. Then, bring on the quail with roast potato and grapes for a bit of sweet and salty. Follow on with the chargrilled octopus on a crisp seasoned potato coin. My personal favourite and the star of the show – be wowed by the tender and succulent beef cheeks with buttery mash in red wine jus, so good you might beg for seconds. And last but not least, the well seasoned Portobello mushrooms. (If you have room for more, make sure you order the churros (spanish donuts) served with a rich chocolate dipping sauce and icing.) By this time, you will have a burst of flavours in your mouth and a very full tummy to boot; but with only the freshest and best quality ingredients, you know you made the right choice with Movida. Quality doesn’t have to cost a bomb too here at Movida’s – 4 of us shared the above dishes and we each forked out $60 (including a bottle of good Spanish red wine). This cosy tapas joint never fails to impress with its smorgasboard of wholesome flavours and personalised service. If the warm wooden interior, beautiful candle centre pieces and crimson lighting doesn’t invite you, the congenial bespectacled owner will. Watch him serve out dish after dish of top notch tapas as he wipes off beads of sweat with a tea towel strewn over his shoulder. Admittedly there were about 8 of us to share the tapas so don’t be overwhelmed by the length of the tapas list that we had below. Make sure you order the beautiful sangria which tastes like a fruit tingle in your mouth or the fine wine served in ornate Riedel glasses. 7. Crispy pan fried scallops with slow roasted capsicum and pistachio cream – Top notch in taste! With a Zing! 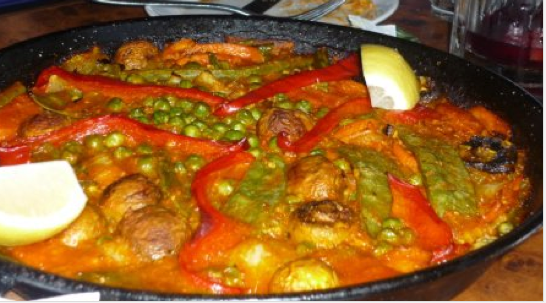 A feast for 8 people – this meal was very very moorish and filling and cost each of us only $40!! 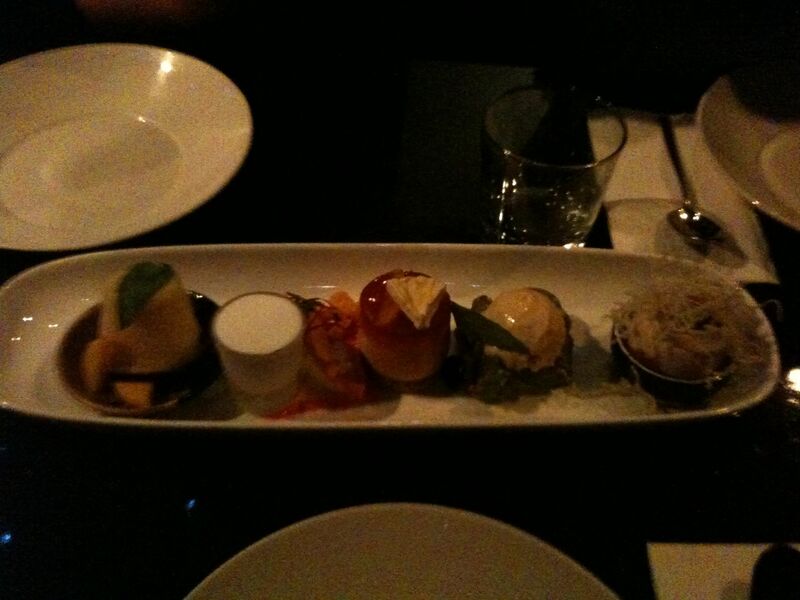 I call it a “Degustation delight” or “Tasting plates of Treasure”. This one’s a little out of left field as it’s not exactly Spanish but hey, it is what I would like to conjure up as “Asian Tapas”. The quality and presentation of their food is magnificent and certainly worth shouting about. As you walk into Gingerboy, you’ll be greeted by their friendly French bartenders whipping up some yummy cocktails at the funky black bar counter against the white backdrop. Stop for a refreshing cocktail at the bar before proceeding into the chic restaurant with a bamboo ceiling, dark wood interior and red tassled lamps. Make sure you order the shared tasting plates – they are the only way to go. For the 3 of us, we ordered 5 dishes – the juicy cuttlefish with rock salt and chilli powder served with freshly squeezed lemon to bring the flavours out, followed by fully packed plump prawn dumplings with great tasting sauces including satay and coriander. Then the fresh flavoursome crispy duck salad with strips of duck skin & duck pieces. Because we simply LOVE duck, we had more duck in the form of the luscious duck san choi bao (shredded spiced succulent duck on iceberg lettuce). Finally the finger-licking good fried crispy salt and pepper chicken ribs – you have to use your hands for this one. But my personal favourite – we ended the meal with the orgasmic dessert tasting plate with 4 types of asian desserts – best described as a concoction of coconut, palm sugar and fresh fruit. Sweet Bliss! c. it doesn’t hurt to have great tasting food and wine too! So here are some of my recommendations – tried and tested – guaranteed to always end with a smile on your face – unless you muck up the date of course. That I can’t help you with. This laid back cafe was set up 20 years ago – cute fact – the original owner decided to name it after his daughter who apparently walks like a turtle. 🙂 In recent years the original owner sold the cafe to 2 friends who wanted to produce great Italian influenced food – and so the Turtle keeps it’s great reputation for flavoursome food, excellent wine and personalized service. Co-owner Michael is a familiar face at the turtle with a friendly smile to welcome his loyal local patrons. For starters, try the Arancini – crumbed rice balls packed full of flavoursome Spinach, Pumpkin and Parmesan. Dipped in Aioli you’ll be wowed by the punch. For mains, make sure you try the Tagliatelle Genovese with succulent wagyu beef, veal, salami, proscuitti, and onion in red wine sauce. Or the delicious Gnocchetti with Italian sausage and fennel sugo. 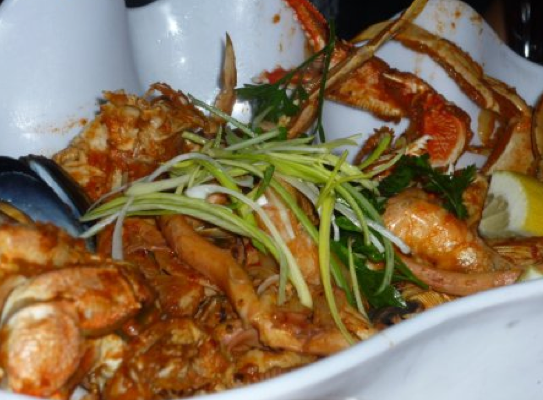 The casual atmosphere & attentive waiters will wind you down and you’ll be in for a great time. 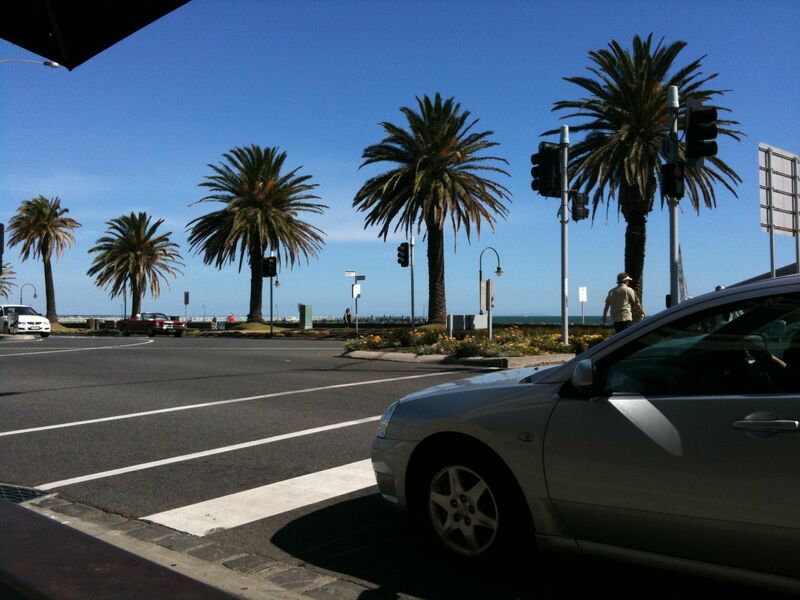 This cafe bar is situated in a great location right across the Port Melbourne beach. Dine alfresco by the beach and enjoy the sea view as you watch the Spirit of Tasmania docking. Offering a variety of nibblies including the Tasting platter – a selection of almond crumbed calamari, cajun chicken, goats fetta, olive tapenade, semi dried tomatoes, marinated vegetables, chorizo sausage, smoked salmon and capers, Thick cut Aioli chips, wood-fired bruschetta, Dips with warm turkish bread or Nachos with beef or bean chilli con carne, there’s bound to be something that will satiate your peckishness. Choose between sitting outside when it’s sunny or within the sun drenched but covered courtyard in loungy leather couches. The cosy and intimate environment will allow you to warm up quickly to your date. 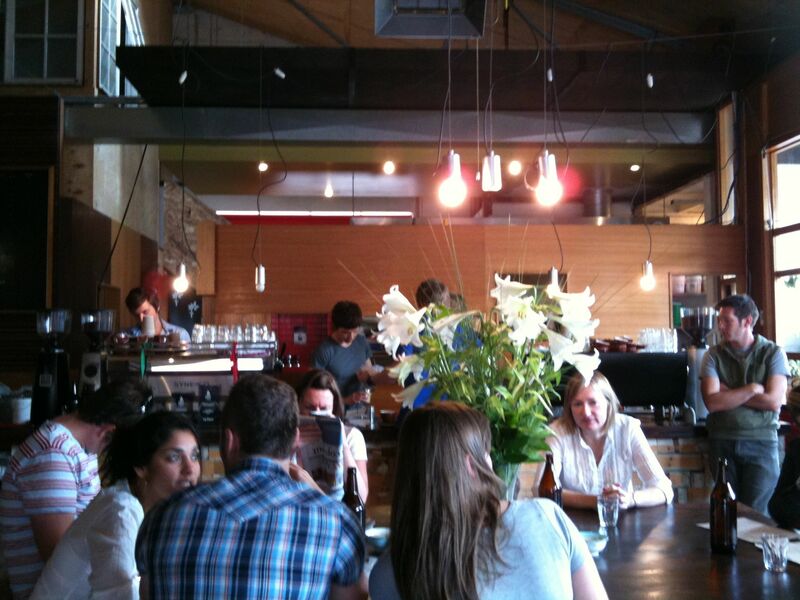 Another really chilled out but cool cafe to take your first date to is St Ali. Tucked away in a quiet laneway off Clarendon St in South Melbourne, this tiny treasure cove offers excellent house roasted coffee that’s rich, aromatic and creamy. You can hear them roasting the coffee away as the busy joint packs up the crowds. The quirky waitress runs from table to table taking orders quickly then coming back each time smiling with plates of food saying “here you go starvin marvins”! 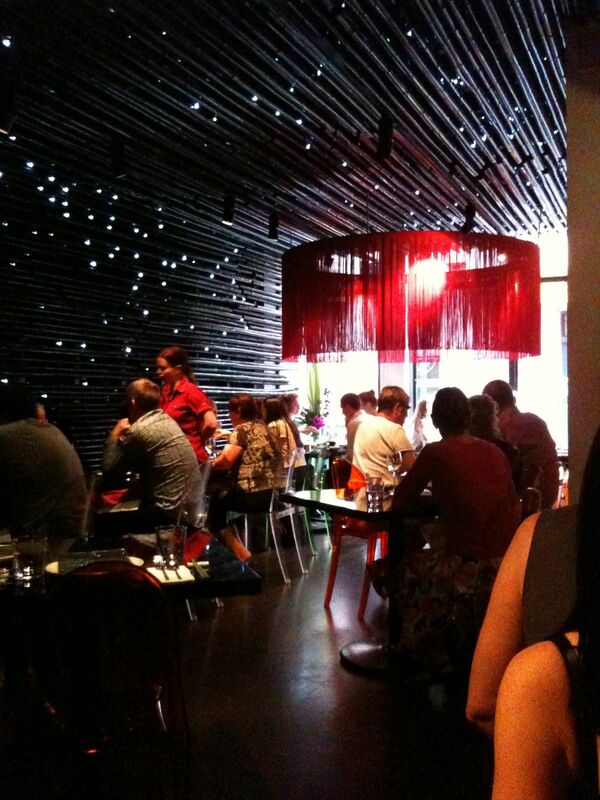 The great cosy interior with yummy food at reasonable prices makes for an easy first date venue. The food in itself becomes the conversational piece as you and your date indulge in the “My mexican cousin corn fritters with baby spinach grilled haloumi kasundi and poached eggs”. 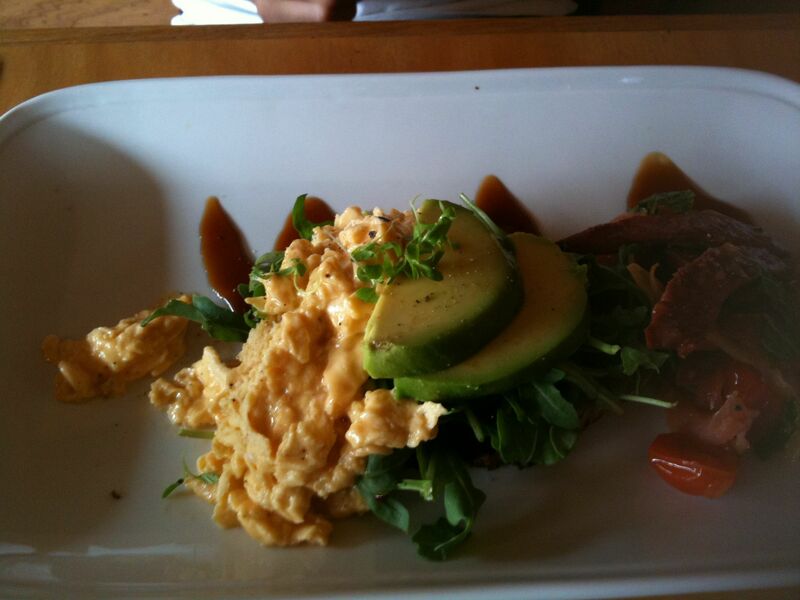 Or delightfully mix and match your eggs with different bits and pieces to create your own breakfast plate! St Ali's "My mexican cousin's corn fritters"
Let’s face it. Who doesn’t like chocolate? No one. OK – unless you are allergic to it or have no idea how to live life. In any case, Lindt Cafe is the best bet for all chocolate lovers. 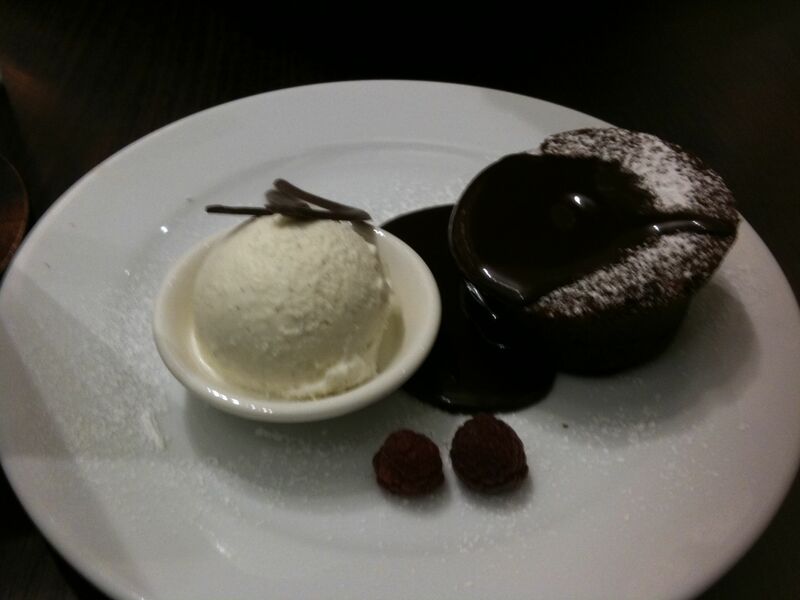 Melt your first date’s inhibitions away with the warm chocolate cake – oozing with a warm chocolate centre and side of vanilla ice cream, it’s bound to impress. Or sweeten your first date’s lips with the sweet chocolate waffles, ice cream and icing ala mode. Triple the sweetness factor with the delicate and light macaroons – choose from a variety of sweet flavours including classic chocolate to pistachio, coconut, strawberry and mocha. A guaranteed heart-warming date awaits you – all it takes is a hearty appetite for chocolate which shouldn’t be hard to come by. I keep coming back to this cafe because of a few reasons – the service is fast and precise, the food is good value & it’s just across the South Melbourne market which makes for easy access to your weekly supply of fresh fruits and veges. You can’t go wrong with that can you? And so the Red Star has a winning formula. The breakfast menu includes a hearty big breakfast of eggs (any style), crispy bacon, sausages, grilled tomato, mushrooms on sour dough toast. Make sure you order a side of the home made hash browns which are more like light thin crispy potato flakes. Or choose from the lunch menu – I like the delicious spanish paella with generous portions of plump prawns, mussels and packed full of saucy flavour served in a pan. After brunch, you can take your date for a leisurely stroll around the South Melbourne market to walk off the scrumptious meal you’ve just savoured. As the season changes, it’s time to get off that couch and take a scenic drive around some of Melbourne’s best trails. If you love Mother Nature, here are some must-see Melbourne routes. Take a leisurely drive up Mount Dandenong, wind your windows down, as you breathe in the fresh alpine air and take in the beautiful landscape of forests and trees. Make sure you stop by Olinda along the way and visit one of the many tea rooms for Devonshire Tea and Scones (with freshly whipped cream and sweet home-made strawberry jam). Miss Marples Tea Room is highly recommended for their scones and high tea. There is also a traditional British charm to this little cottage. Their moorish home made cottage pie and welsh rarebit (mature english cheddar, eggs, guinness mustard & spices) sandwich fingers are to die for. Note: They don’t take reservations so make sure you get in early at 11am to get a table. It can get quite packed and you have to expect a bit of a wait on weekends (but its certainly worth the wait). After a satisfying meal, make your way to the Mount Dandenong Observatory – 633 metres above sea-level and the highest point in the surrounding ranges. Here you can get breathtaking views of Melbourne and surrounds. It’s also v romantic. All in, a fantastic & cruisey way to spend your Sunday. This is another beautiful scenic drive up a mountainous area. Take a leisurely walk along the wonderfully scenic Warburton River Walk which is accessible from the Swing Bridge, just off Main Street. The beautiful Yarra River transforms from rapid pools to meandering waterholes along the length of the walk that is probably about 5 kilometres. You can spot the lyre birds & cockatoos along the way. End the relaxing stroll with a stop by Three Sugars Cafe for some hot chocolate, coffee & cake or some of the best pies in the region. The best time to go is during Spring/Autumn to see the Oak & Maple trees change colour. A “must do” is the Springtime in Bright Festival – October 24 to November 3. Make sure you take your bicycles with you so you can best appreciate the sights and sounds of Bright as you breeze through the Great Alpine Road. If you’re feeling peckish after the ride, there are many fine quality restaurants in the area such as the Poplars Restaurant , a French Bistro drawing on local fresh produce and wine or the Edelweiss Bakery for a simple treat of freshly baked sweet & savoury pastries. You will need a long weekend for this drive but the Grampians is the place to go to soak up the best of Nature. Here you can scale the Pinnacle or check out McKenzies Falls. Word of warning, you might need to have a certain level of physical endurance to complete the Pinnacle walk which is a 5 km trail overlooking Grampians National Park. The steep and winding steps are a challenge but the lookout at the end of the trail is certainly worth the hike offering breathtaking views of the rolling hills and mountainous valleys. Drive along Lake Wartook Road then take a 1 hr return walk to McKenzies Falls – the largest waterfall in the Grampians. The sound of the water splashing down into the lake creates a peaceful harmony with the leafy trees in the backdrop. Perhaps the one walk you shouldn’t miss out on is called “The Cape” within the Mornington Peninsula National Park trail offering spectacular views of the Bass Strait. Make sure you take this long scenic walking trail – a reconstructed staircase and boardwalk which has been built right out of the beach and rock platform level. At the end of the trail, you can visit the Cape Schanck Lighthouse which has served shipping since 1859. I always feel refreshed after the walk, and am enthralled by how you can find a piece of serenity just 90 min from Melbourne city. To me, crepes are such simple food but with such flair and class. So what makes a crepe what it is? Crepe is typically a type of very thin pancake (usually made from wheat flour) & of French origin – it is also considered a French National dish (Wikepedia). Here’s my Top 5, I hope you enjoy my Crepe journey over this next post.. This Ivanhoe cafe suits the nocturnal foodie in search of a satisfying late night snack. Only open at night from 6pm till 2am (weekdays) and 8pm till 2am (weekends), not many people know of this uniquely unexpected cafe that serves up a variety of pancakes & crepes – both savoury & sweet. The ambience & interior is warm & cosy – with red hanging lamps, dim lighting, long dark wooden dining tables & a fireplace. There’s an intriguing black & white print on the wall of a cow & other contraptions so you can observe the oddities of how crepes are “created” whilst waiting for your warm comforting crepes to be freshly made. I had the warm & spicy apple crepe, dusted with icing & served with ice cream plus a chilled pineapple crush to accompany my crepe. It was simply divine. My friend had the ham & cheese savoury crepe – it was unpretentious and the texture of the crepe was unbeatable. Part of the thrill of visiting this place is you feel like you’re going on an adventure just finding this cafe, then the late opening hours add a sense of excitement too and oh, the toilets in the shed..that’s an experience in itself..spooky to say the least..but all in, certainly worth a visit! Thank you SS for recommending this cute creperie in North Melbourne. The quaintness of this place begets the class it exudes in both the homely service & luxurious quality of crepes. Ah Frau, I could go back again and again. I was pleasantly surprised that it was set up by a young local Aussie lady inspired by her travels to Europe. Real brick interiors, timber floors, stained glass windows, & a steep wooden staircase leading to the second level make for a very European decor. Freshly baked croissants come cheap too – at half the price of other cafes you get a ham, cheese & tomato croissant at $4!! Freshly baked muffins in a tin tray & an exciting selection of chocolates & sweets greet you at the counter. Of course, there is also a huge array of sweet & savoury crepes – the sweet crepes are served with the delectable Frau melted chocolate. I had the kransky galette – cheesey kransky wrapped in light crepe, served with a side of beautifully dressed balsamic vinegrette salad. Guess what? They do takeaway too so be wowed by this creperie and ensure you make a visit to Fraus this weekend! 2 locations mean easier assessibility to crepes. Briezoz is a French creperie which serves up traditional French crepes and French cider. There’s an old school charm to this creperie as you walk into the cosy wooden decor, welcomed by French (or French-speaking) staff. Watching the staff personally create the crepes on the hot iron crepe machine is an experience in itself. Then wait in anticipation as the hot thin crepes are served – sometimes with fire! for the crepe flambe! For $10, I got a “complete crepe” which was a ham, egg & cheese crepe. You can add extra toppings for $2.50. Our pear cider too went down really well with the crepes. You can enjoy these thin tasty crepes 7 days a week for lunch or dinner! I wonder if Roule Galette put Aix Cafe out of business as these 2 creperies were located within a stone’s throw of each other; until the humble Aix closed down recently. In any case, Roule Galette packs up the crowds in its tiny abode dishing out 12 savoury crepes comprising of snails, scallops, salami, chicken, and even an interesting Aussie option. If you like your sweets, choose from the 15 varieties including the ol’ faithful nutella at $6 to the crepe suzette flambe at $9.50. I had the chicken du chef which was “wonderful saute de chicken with fresh mushroom and a bit of cream” at $11, it was value for money. Beckie had the Forestiere – filled with bechamel (French white sauce) with bacon, mushroom, and cheese – a recipe from the owner’s dad at $9.50. All crepes are made with buckwheat flour creating the unique French crepe texture they call Galette. Make sure you order the Henry of Hartcourt pear cider at $3.50 a glass to go with your crepes. I was pleasantly surprised by this creperie located on Keilor Road; I certainly wasn’t expecting much but was quite taken by the texture and quality of the crepes. 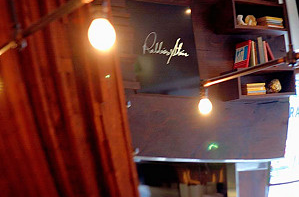 Step into a lovely lunch time venue with hanging lamps, modern timber architecture, jazz music & Tea 2 displays. Nothing is over $10 – I got the mediteranean crepe at $9.90 with an antipasto platter within a crepe! Quite unique I should say and appeals to the one with a penchance for olives, eggplant, salami, feta & sun dried tomatoes! The sweet crepes are reasonably priced too – for instance the peanut butter and honey crepe is only $6.90. My colleague had a chicken chicka- fresh melted mozzarella cheese with chicken and mushrooms, so delish were his exact words. According to Wikipedia, brunch is a combination of breakfast and lunch, typically after a morning event or before an afternoon one. It is also my favourite time of day for a good feed. 😉 Melbourne has some fabulous all day breakkie joints – there’s nothing quite like sleeping in on a Sunday and then cruising off to enjoy a lazy Sunday fry-up with eggs, eggs, & more eggs! Did you know that Mart is Tram spelt backwards? And how apt a name as Mart 130 is located at an old tram station master’s office on tram stop 130. It’s all about the spectacular breakkie they serve here, as a long line forms on weekends particularly from 11am onwards. However, there is an excellent waiting system at this quaint little joint. Head into the cafe, leave your name & number of people with the wait staff and sit outside alongside the tram line as your order of coffee is served. In no time, you will be comfortably seated within the enclosed deck overlooking the Albert Park tennis courts tucking into some darn good breakkie. Using only free range eggs, the rustic home-style fry up include ham hocked home cooked bake beans, slivers of chorizo sausages, crispy bacon strips, & perfectly poached eggs on thick sour dough organic toast. Try their signature crunchy oven-roasted corn fritters made with fresh corn & served with tomatoes, bacon & a coriander garnish. Afterwards, don’t fret as the tram is just a hop & skip away. Previously the WB Ellis Auction House, this beautifully presented cafe offers a simple yet interesting menu that’s bound to surprise you with the options available. Work your way through names of dishes like “Opening Bid”, “Counter Bid”, “No big deal”, “Silent bid”, “Real deal” & the like. Featuring free range “green” eggs, have it any way you like, steamed, baked, fried, scrambled or poached. If you’re feeling adenturous, you might like to try the hazelnut crumbed lamb brains on bacon & spinach with onion jam. The decor is stylish with high ceilings, classy long wooden dining tables, hanging lamps and a very rustic torn-paint-on-brick look. I had the “Shady deal” – spicy chorizo with thinly sliced hash brown, morrocan-spiced carrots, baked eggs with lemon & parsley on a soft wrap. The Morrocan spice provided an excellent surprise ZING! The flavoursome fresh baked eggs were packed with flavour. I’m SOLD! Tip: Come with a small group of 2 -4 people or you might expect a long wait particularly during rush hour 11am-12pm. We were meant to check out Porgie & Mrs Jones but due to Mother’s Day bookings, we had to leave Porgie’s and thank God for that as we concurred that comparatively, Replete was heaps better, largely due to the shameless lack of service at Porgie’s. Replete’s breakfast menu is simple but moorish. For instance, at $17.80, the Replete breakfast consists of perfectly poached eggs, spanish sausage, Istra bacon, hash brown, roasted tomato & field mushroom with toasted sourdough bread. Or you can order the classic egg benedict or florentine and add extras such as field Mushrooms, spinach, hash brown, roasted tomato, avocado, hollandaise at $3.80 ea or house baked beans, spanish sausage, Istra bacon, fruit Compote, marinated fetta, King Island Yoghurt at $4.80 ea or Smoked Salmon at $5.00. WOW. 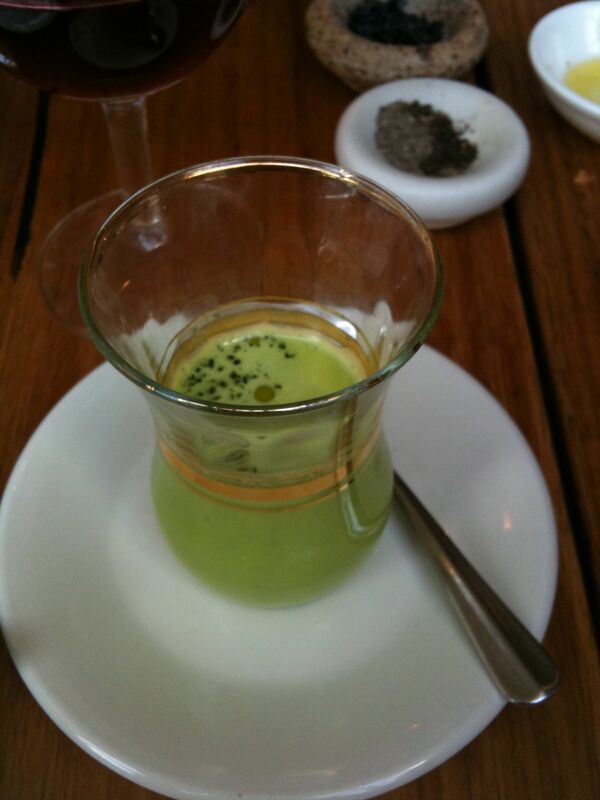 Replete is indeed a treat for the breakfast junkie. 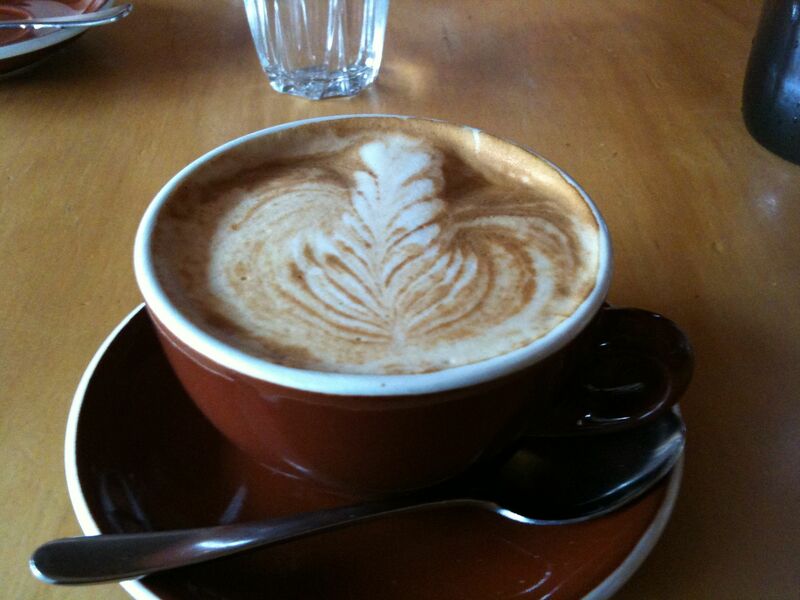 Tucked away in a corner in South Melbourne (near the South Melbourne Markets) is the lovely Cafe Sweethearts. No doubt you will find crowds gathering every weekend at this charming joint. The pancakes are to die for and guess what? 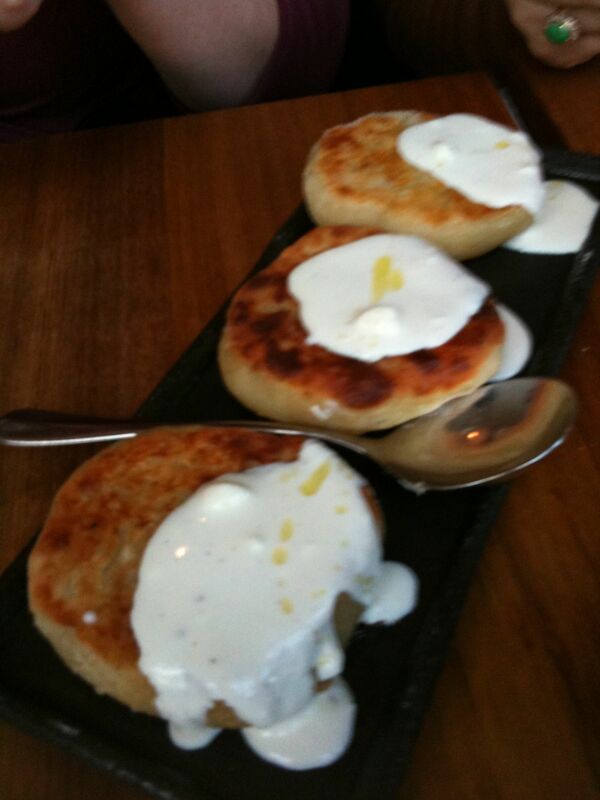 You can find both sweet AND savoury choices. A fried egg & grilled bacon on pancakes? Yes, they are gorgeous and served in speedy fashion as well. The eggs bene, is a crowd favourite served in perfectly prepared hollandaise, ham & topped with chives. This Middle-Eastern inspired cosy cafe serves breakfast from 7am – 3pm. Be greeted by slightly grunghy but friendly wait staff, as you gleam past the array of sweets through to the open kitchen before getting seated onto dark wooden chairs & round tables. The intimate setting & reasonably priced quality food make for a good brunch venue. Tagine-style beans on toast were a draw at $10.50, what about the Shakshouka – baked eggs with Israeli tomato casserole at $11? If you’re very hungry, go for the Gingerlee BIG breakfast at $18. All eggs are served with sourdough toast. Specials are updated daily on the board. The home made condiments – tomato jam, plum jam, quince jam & apple chutney are a must try. Tapas range from $5 – $9. Portions are good and not overly massive. My friend had the lunch menu spagetti puttenesca served with green olives, shaved parmesan in a good sized bowl for $14.50. Delish! Sambal chilli is a chilli paste and it forms the base for most spicy Asian recipes. There are many types of sambal chilli but the recipe shared is one of a Singaporean origin. According to sambalkitchen.com, “Sambal” is commonly used in Singaporean, Malaysian and Indonesian cuisine, it is a spicy paste of onions, garlic & chilli usually cooked in oil. It can serve as a condiment or as a base for making other dishes. PS You can get these ingredients from any Asian Grocer. 1. Split the above ingredients into 2 lots to fit into food processor. 2. Place first lot of ingredients into food processor. 3. Grind till you get the above sambal texture. 4. Put in a dash of water during grinding process. 5. Repeat process with second lot of ingredients. 6. Combine both lots to form Sambal Chilli. 7. Refrigerate for later use or serve as condiment. 7. Stir and simmer for a few minutes before serving. Originating from Southern India, Sothi is a delicious gravy made of coconut milk & vegetables. 8. Lastly, add dash of fish sauce, salt & pepper to taste. The above dishes are best served with rice.